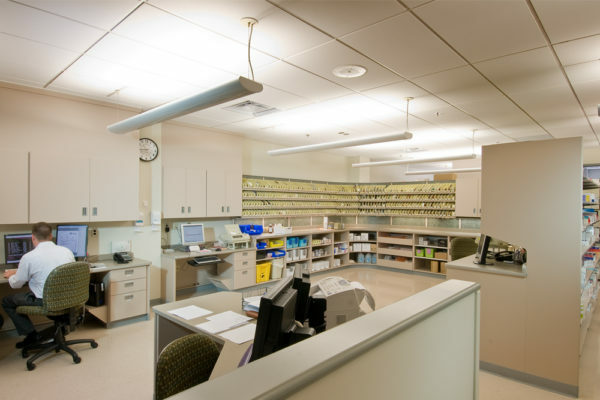 This 34,000sf addition tripled the size of Rome Memorial Hospital’s existing Emergency Department, doubled their number of treatment rooms, and greatly improved access to emerging technologies and state-of-the-art emergency medical care in the greater Rome area. Increased efficiency and improved observation and response time are achieved with centralized nursing stations. Separate entrances for different treatment types create better patient flow, while more public wait space and liberal use of day-lighting result in shorter wait times in a relaxed tranquil atmosphere. The architecture reflects the patient friendly policy and approach at Rome Memorial Hospital. The addition also creates a new ‘front door’ for the hospital, increasing visibility and welcoming the public to their new facility.